Level up your gaming hardware with the Cyborg M.M.O. 7 Gaming Mouse. Cyborg took all of the standout features and technology from the world's most adjustable gaming mouse - - the FPS-revolutionizing Cyborg M.M.O. - - and then enhanced control and ergonomics to create the ultimate weapon for MMO gamers. Whether you play WoW, EVE, The Lord of the Rings Online, Star Wars: The Old Republic, Guild Wars, or RIFT, the Cyborg M.M.O. 7 delivers powerful macros and programmability to support any MMO. 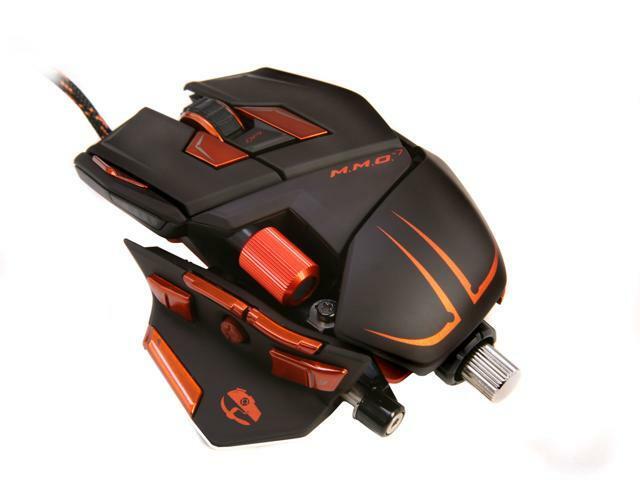 Perfect your grip Whether you ‘palm’ the mouse or ‘claw’ it, the M.M.O. can quickly and easily adapt by adjusting in length to suit your hand size and grip style. In addition, the Thumb Panel of the M.M.O. 7 moves forwards, backwards, and pivots outwards, giving you perfect positioning for effortless gaming. The Cyborg M.M.O. 7 even features 3 interchangeable Pinkie Grips/ 3 Palm Rests. Assign 78 Programmable Commands for ANY Game 13 programmable buttons team up with a 3-position MMO mode switch and a 2-position MMO shift button to forge 78 user-definable in-game commands. Combine the programmable buttons with standard left and right mouse buttons and it all adds up to 15 buttons with which you can punish your competition. Unique 5D Button and Dual ActionLock Buttons Use the 5D Button to click up and down, left and right, and press in. Perfect positioning under your thumb provides lightning-fast access to your most important gaming commands. Mimicking the size and shape of the Precision Aim button found on its rodent brethren, Cyborg M.M.O. owners will feel right at home. When you fight several hours into a raid and your fingers start to feel the effects, a single click of an ActionLock button delivers much-needed relief. Each ActionLock button gives constant input to the main left or right mouse buttons when locked. Activate one for fatigue-free camera movement and character control, or unlock it to resume obliterating your foes as normal. Intuitive World of Warcraft Plug-in The talented developers at Cyborg have crafted an add-on that enables you to drag and drop spells, inventory items and macros directly to the buttons of the mouse. No more lengthy setup - - just jump in and quickly create the perfect configuration without the need to change any of your existing action bar settings. Powerful Cyborg ST Programming Software Cyborg's proprietary Smart Technology (ST) software gives you total control over the M.M.O. 7 Gaming Mouse's unique features. Adjust macros and set keybindings, tweak cursor sensitivity, create custom profiles for each game, and assign commands to your programmable buttons and modes. Easy, quick, and the all power you need right on your computer. Choose one of 16 million RGB colors to backlight the left and right mouse buttons. The ST software allows you to adjust the backlighting to suit your preference. True 6400 DPI 'Twin-Eye' Laser Sensor and Custom Weight System The Cyborg M.M.O. 7 Gaming Mouse’s new-generation 'twin-eye' laser sensor reads each axis separately and tracks up to a stunning 6 meters per second with pinpoint accuracy. Pro gamers who prefer low sensitivity with high movement speed will always experience correct tracking and precision. Four user-definable DPI settings range from 25 to 6400 and the DPI button lets you easily cycle through your custom settings. Five 6-gram weights can be added or subtracted in an instant, giving you the perfect weight for a perfect feel. When not in use, the weights can be safely stored in the supplied Weight Storage Container. Pros: everyone who touches my mouse is heavily stumped on how to use it. very accurate on shooter games and the hotkeys are easy to use on MOBA games. Cons: It began to fail on the optic lens and sometimes the mouse doesn't recognize movement or it gets inverted on its own, I have to give it a good ol Fonzie and it starts working again, sometimes 2 or 3. Cons: The mouse, no matter what thumb rest, pinky rest or palm rest you use, will always be uncomfortable. It is not a mouse to use for over 2 hours because your hand will ache. It is, at times, unbearably heavy. Using it for a first-person shooter would be a terrible mistake. Other Thoughts: This has been a backup mouse for the majority of the time I've had it. During the short times when I would play Torchlight II, it was very useful. Pros: I've had this mouse for over three years. It is an excellent mouse. I really like using it for my gaming hobby. If you stay on top of software updates you will not have a problem with it. It has increased attack speeds by 20% to 50%. I would/have recommended the MMO 7 to many gaming friends! Cons: This is a high end tool, not a hammer, it takes some getting use to. I've been into computers since the mid 80's. I build my own computers. If you think your mouse will last forever, you are sadly mistaken. If they get more of these in I will get a new one. Anything that has moving parts will ware out, the more you use it the faster it wares out, it's that simple! Pros: Lots of buttons, ergonomic design quite easy to use software for programming. The software allows this mouse to do much more than i expected. Cons: Would not recommend buying though. Had problems with cursor only moving horizontally. Having issues with mouse double clicking. Overall bad mouse that should work flawlessly and seeing other people run into the same problems. Quite disappointing but you will like it for a couple months. Had it for 3.5 years now, do not buy cyborg M.M.O. 7. Pros: The mouse was great when it worked. All of the buttons could be customized to my liking for M.M.O's and other games that required more than a keyboard could offer. Customization on the physical side of the mouse was adequate. Cons: The left click, just as many other reviewers have stated, started unintentionally double clicking after 8 months of use. The physical customization of the mouse seems more like a gimmick rather than an integral, or even useful part of the mouses functionality. You can easily find a mouse that costs less, has variable weighting and customization options, better software (every time you want your extra buttons enabled, you have to manually open the program and load your profile), and has the longevity that a gaming mouse should have. Other Thoughts: I wasn't immediately disappointed with this mouse. It looked unique and I had fun playing with the physical changes to make it my own. The longevity of this mouse, however, is what makes the purchase of this mouse a mistake I will never make again. Judging from the reviews of their other products, it's an absolute miracle that this company can continue to pump out products and sustain themselves. It also shows how much and often they listen to their consumers. Cons: Mouse becomes jittery and unresponsive as if it was a wireless mouse running on low battery. Other Thoughts: With the mouse randomly locking on the x and y axis randomly, it makes any serious gaming impossible. Pros: The mouse does feel great and because of the customization options it can be set to what you want. Which I love. Its very comfortable and the array of buttons are great. Cons: Honestly this is going to be the second time I am sending this mouse back. Looks like its magic mark is 1 year of survival and then things go bad. the first time it was the left mouse button that would double click on every single click. Now the laser will randomly just switch off. The buttons will still work but the pointer no longer moves. You have to basically unplug it and plug it back in in order to get it to work. Very disappointing.